Home > Blog > How Much Are We Worth? 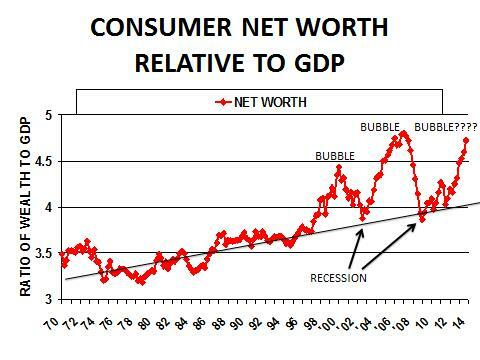 The Federal Reserve recently announced that U.S. consumers were now wealthier than at any time in history, this in spite of the weakest recovery from the worst recession since the 1930s. This seems to characterize many if not most of the industrialized countries. Asset prices are rising, but the real output of these assets is not. This makes no sense, and when this is the case, markets tend to adjust to resolve the inconsistency. In this case, either output must rise to justify high valuations, or valuations must fall to square up with the actual output countries and companies are producing. To calculate my net worth, I have to figure out the value of all my assets and then subtract the total amount of my liabilities (debts and promises). To start, I would list my physical assets: one home, two well used cars, three TV sets, the family silverware, my wife’s engagement ring, some tools, 100 shares of Intel (ownership of a small fraction of Intel’s productive assets), a few 10-year government bonds, one gold coin, a used boat, etc. You get the picture, a list of the real things I own. My debts, denominated in dollars, are clear. To value my assets, I must assign a value (price) to each item, multiply by the units I own and add it up. That’s my total assets. Subtracting my debts yields my net worth. In principle, this is how the government does it for an entire economy. The chart below shows the growth (and sometimes decline) of U.S. net asset value since 1970 (This does include “non-profits,” but they hold many of the same types of assets). One conclusion from a cursory look at the charts below (with illustrative pre-2000 trend lines) might be: “Let’s have another great recession; look at the increase in wealth it produced.” Then a second thought, one might wonder why we have had such a lousy economic recovery with so much new wealth. Some might respond: “The top 1 percent have all the wealth and don’t spend it; they own all the assets like stocks and bonds and big houses that have appreciated so much.” But many more own stocks and bonds and houses and cars and other assets than the top 1 percent. A lot of people should be spending at least a little bit more now that they are wealthier. Then one might consider the possibility that the value (prices) we assigned to the stuff we own might be wrong, that markets have been so interfered with that we no longer really know what “real value” is and can’t figure out what we are really worth. Do we really have a lot more stuff, real wealth, or do we just think what we have is more valuable? 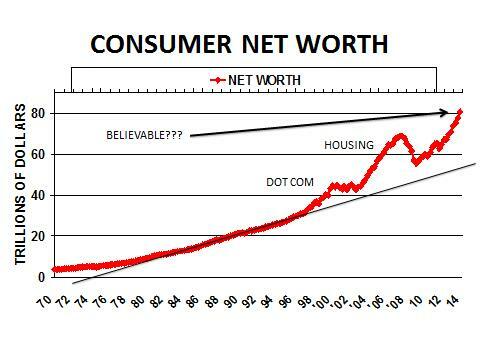 Can we really have deviated so far from a three-decade wealth growth trend line and be so much wealthier? I have my doubts. Central banks everywhere are distorting interest rates and supporting inflated valuations. Currencies, bonds, stocks, deeds, titles, etc., are all paper claims. Ultimately, our wealth is measured by how much stuff we can acquire with it and how much the assets we own can produce. I’m not sure we’re worth all that the statistics say we are ($80 trillion in the U.S.). William Dunkelberg is professor emeritus of economics in the College of Liberal Arts, Temple University, where he served as dean of the School of Business and Management from 1987 through 1994 and as director of the Center for the Advancement and Study of Entrepreneurship. 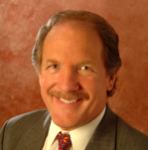 He currently serves as chief economist for the National Federation of Independent Business (400,000 member firms; since 1971) and as economic strategist, Boenning & Scattergood. His prior appointments were at the Krannert Graduate School of Management, Purdue University, the Graduate School of Business, Stanford University and the Survey Research Center at the University of Michigan. He has a B.A., M.A. and Ph.D. in economics from the University of Michigan. Dunkelberg is a nationally known authority on small business, entrepreneurship, consumer credit and government policy. He was reported by the New York Times to be one of four final candidates for vice chairman of the Board of Governors of the Federal Reserve System in 1981, served as an advisor to the Secretary of Commerce, and was appointed to the Consumer Advisory Council of the Federal Reserve System in 1989 (2 year term). He is a past president and a Fellow of the National Association for Business Economics (NABE) and was awarded the Abramson Award for the best paper in 2009. He was appointed to the Census Advisory Committee representing the American Economic Association in 1992 and again in 1995 (serving as chair) and served on the board of The National Bureau of Economic Research from 1996 to 1999. He is an elected member of the Conference of Business Economists (and chairman in 2003) and the National Business Economic Issues Council and the first recipient of the Small Business Administration’s Research Advocate of the Year award. In 2008, the Haas School of Business (Center for Executive Education) at the University of California Berkeley honored him with their Leading Through Innovation Executive Award.